In my post “Screenwriting by Numbers” I pointed out some basic numbers common to the majority of produced screenplays. But now we’re going to go beyond mere numbers and talk about what make movies work beyond the level of entertainment. The only time I watch cable TV is when I’m on the road. And it seems like every trip I take The Shawshank Redemption is on some channel. Maybe they should just dedicate a channel to that movie. The Shawshank Channel. The simple reason that film is on so much is people love that film. It trades places with The Godfather on IMDB.com as fans’ favorite film. It’s the highest rated film by Yahoo! Movies and by the 2006 the readers of Empire magazine. Once King had success then he had to deal with a drug and alcohol addiction as well as getting hit by a van while the driver was reaching for “one of those Mars bars.” A collapsed lung, a broken leg in nine places, a shattered hip and after who knows how much physical therapy and pain, he is still writing away. Stephen King understands hard times. We understand hard times. That’s a universal theme that doesn’t need explaining. 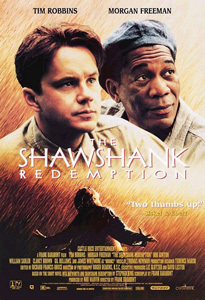 I think Shawshank’s ongoing popularity is because the story simply transcends film. Director Frank Darabont talks about getting many letters from people thanking him for making that film because it helped them through a difficult time in their life. It’s doubtful that when King wrote the Shawshank story or when Darabont wrote the script that either were thinking that this male dominated prison story would bring comfort to a woman going through a divorce. But good stories have a way of creeping into our lives in unexpected ways. Something resonates in those films with large groups of people. I heard director Robert Zemeckis (Forrest Gump, Back to the Future) recently say on a DVD commentary that his films were a mixture of spectacle and humanity. I think that would be true of most of the above films. When we write we are writing about ourselves. A good part of writing is self-discovery. The odds are good that in the films you see over and over again you are identifying with a character or a situation. This is where we tap into writing beyond the numbers. It’s the reason that films that don’t fit the typical Hollywood mold find an audience. Have you ever walked into a show home and been impressed at first only to feel that it’s well decorated but impersonal? The house I grew up in had a place in our kitchen where we had a growth chart on a wall. It was fun to look back over the years and see how you had grown. I’ve never seen a growth chart in a show home. No worn out carpet, no stacks of paper, no drawings by the kids on the refrigerator. Nothing authentic. No sign of life. Just as your home should be full of stories and memories- and life- so should your screenplays. What sets your writing apart? The same thing that sets you apart from the crowd. Your vision, your life experiences, and your worldview. It is why first time writers (like Diablo Cody) sometimes break in with an original story. (By the way, speaking of Cody, the Juno DVD is out this week.) This is also where Screenwriting from Iowa…or wherever you live outside LA comes into play big time. Here is why I think writers from outside LA, or writers in LA that keep their hometown non-LA roots, have a better chance of showing audiences something new. I heard a speaker once say that basically we all grew up in the same neighborhood. I took that to mean we all long for the same basic things; Food, shelter, love, dignity, purpose. Primal needs as Blake Snyder would say. You don’t have to be a salesman to identify with Willy Loman’s need for significance in Death of a Salesman. Sometimes as writers we jump through all kinds of strange hoops trying to guess what will sell. We err on one side by trying to write the sensational story that everyone will love and on the other side by writing the small personal story where nothing really happens. They’re all about identity. Yes, we can identify with not only people, but pigs, orges, fish, and horses. We want to be the hero of our story and we are inspired by heroes of stories we read and watch. We identify with them. We identify with William Wallace, Hans Solo, Erin Brockovich and Cinderella. That trend hasn’t stopped in the 2000s, nor is it likely to as longs as human beings roam the earth.